Ice cubes that are initially at 0ºC will cool the liquid being shaken more quickly than ice cubes that start well below 0ºC, due to the latent heat of fusion (79.72 cal/g) being higher than the specific heat (0.5 cal/g) of ice. In addition to the difference in cooling mechanism, the fact that once melted, the liquid water will be carried away by the liquid and expose new solid ice to be melted, should allow for faster heat transfer between the mediums. Take temperature of ice (fresh from freezer) using infrared thermometer. Add water to shaker and record mass. Start 30s timer, and shake vigirously. Strain water into cocktail glass. Measure temperature of water in cocktail glass using instant read thermometer. Repeat steps 1 through 13 using melting ice (cubes placed into a bowl to warm up should be extracted from their melt water first) instead of fresh ice. You should now have two Classic 1950’s Martinis (as described in Vintage Spirits and Forgotten Cocktails ), shaken not stirred. For best results add a dash of orange bitters to each, stir and enjoy responsibly. Using the procedure above, the following data was collected. Using the measurements taken, the following table of observations can be made. 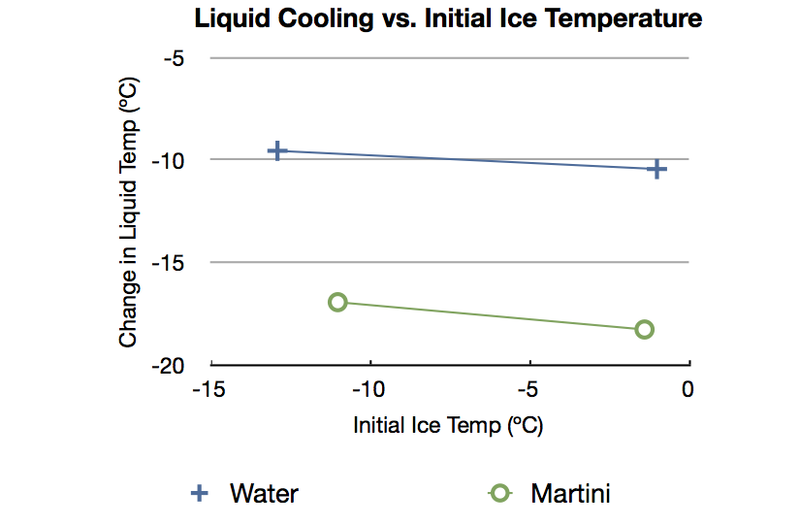 As the following graph shows (click to enlarge), for both water and a martini, the amount of cooling observed was greater when the ice started at a warmer temperature. The change was greater for the martini (steeper slope), however the amount of ice lost during the shaking may water down whatever is being shaken. When shaking a liquid with ice, as one might do when making a martini for James Bond, the ice will cool the liquid, and the amount of cooling depends on many factors. In this study we examined the importance of the initial temperature of the ice. These results suggest that starting with warmer ice will result in additional cooling. However the additional cooling comes at the cost of additional ice being converted to water which may adversely affect the finished liquid. Therefore while the amount of cooling observed is greater when starting with warm ice, it may be advisable to start with a cool liquid and shake with fresh ice. In this study the question of cold versus warm ice was examined, however the original observation dealt with reusing ice. While using melty ice seems like a logical proxy for reused ice, additional experiments should examine if these results actually hold for reused ice as well. Additionally, a qualitative study of beverages made using warm and fresh ice to determine if the additional melting is in fact a problem. Variables that were not considered in this study that may warrant further inspections include the volume of fluid, the initial temperature of the fluid and the amount of ice used.